Who knew four hours could fly by so quickly?! I just got home from the most fabulous cooking class at Create-a-Cook. I’ve said it before, but I’ll repeat it again until you believe me — the classes at this establishment are by far the most fantastic learn-to-cook experiences in the greater Boston area. 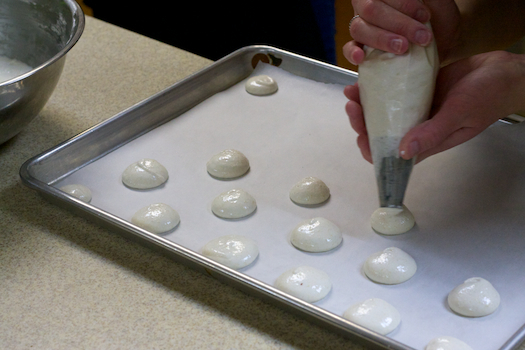 This week I learned how to make French Macarons! Seriously! 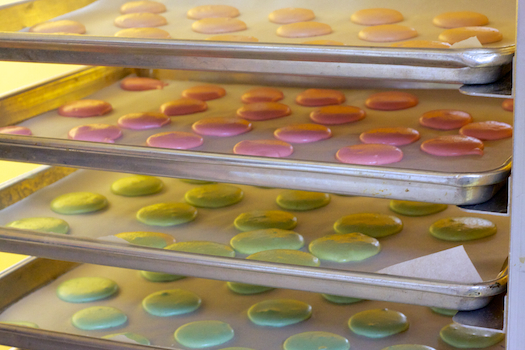 Jacqueline Lee Donabed, proprietress of The Blue Macaron, is teaching a number of sessions this month and next in Newton Highlands and I seriously hope you signed up for one because it’s not to be missed. Admittedly, I definitely woke up this morning with a less than enthused attitude about baking today. I have NaBloPoMo blog posts to prep and bank, a bunch of contract work to catch-up on, and I’ve skipped going to the gym for the last two days so I absolutely was having buyers remorse about giving up my afternoon to a hot oven. Which, let’s face it, was a truly silly reaction to give in to. Especially when history clearly illustrates that I adore Create-a-Cook. My brain truly is my worst enemy sometimes. Anyway, Jackie took a pretty complicated subject and managed to explain it in such a way that the rather daunting task of making this elegant treat appeared completely doable. I truly appreciated that she took the time to walk the entire group through the prep, shaping, baking, and filling process in its entirely before sending us off to try our hand at crafting our own batches. I don’t think I would have had a clue as to what was going on if she hadn’t framed the class in this manner. It was an excellent balance of demonstration and hands on time. One intriguing bit of trivia that I gleaned from the session included the slightly mind boggling fact that all of the varied flavors that one tastes while eating macarons almost always stems purely from the filling and not the cookie. I was also intrigued by the psychological aspects (and perhaps tricky possibilities too) of creating macarons flavored with a rich filling that was also dyed with an unexpected shade. For instance, what if you made a blueberry filling and sandwiched it between two orange cookie halves? Pretty devious, right? Oh wow. I almost forgot about this, but the salted caramel made in the first part of our instructions was to-die-for. I generally would never go out of my way for caramel. I usually rate it as one of my least favorite and therefore most useless flavors but I’m pretty sure I would jump off a cliff if someone tossed a bowl of this sweet and sticky goodness over the side. 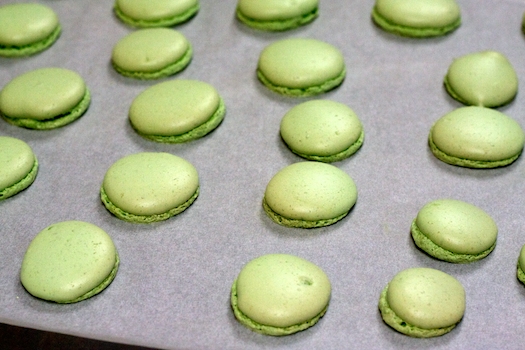 As you can see from the images of my bright green macarons, some are more visually acceptable than others but all-in-all I think I did a pretty good job for my first time. Not only did I learn how to make the macaron shells, French meringue and salted caramel, but I also had hands on (and spoons on) experience whipping up a minty ganache filling. 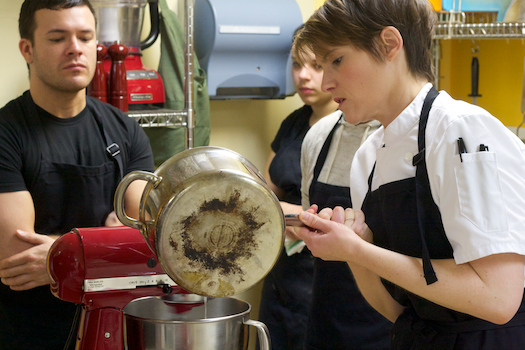 If you’d like to take advantage of the opportunity to try all of the flavors that you create in the class then definitely bring a friend. I traded some of my Chocolate Mint Macarons for my friend Jeff’s Spicy Chocolate. Boy do those pack a punch! I’m now the proud owner, at least until I eat them all, of a huge tray of glossy topped cookies. I also really feel like I need to make these again immediately lest I forget everything I’ve just learned. Unfortunately, I think all of Jackie’s Macaron classes are sold out right now but if you really want to learn how to wow your friends and be the toast of the neighborhood dinner party circuit then I’d suggest contacting Create-a-Cook and gently suggesting that they get a few more of these great opportunities on the books for the new year. PS: The fact that persnickety, which just happens to be my favorite word in the whole wide world, is used in the class description totally makes my day. Also, I desperately need a tall glass of milk because I’m pretty sure I’ve eaten almost a dozen cookies. It was so worth it though. Thanks for the fantastic write up Erin. 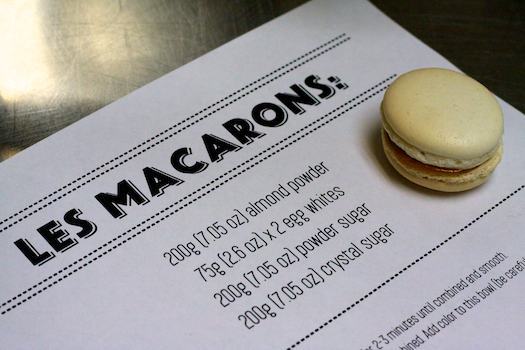 We are indeed adding more Macaron classes to the playlist for Jan-April. Jackie and I had time at the end of the class to figure out the dates. 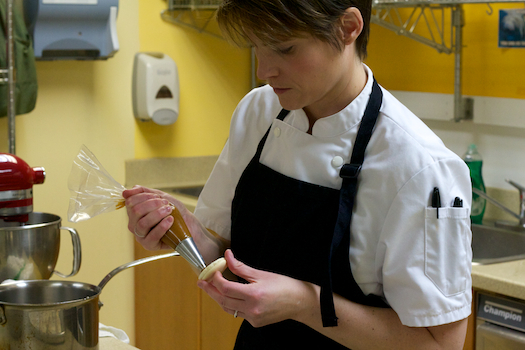 We are also going to have her teach a Tarts class and a Pate a choux class. So it will be extra super fantastic. That is outstanding news! Sign-me up. You guys seriously have such a great knack for finding the best instructors. I always leave feeling reinvigorated about cooking — so thank you! Oh this sounds fabulous! 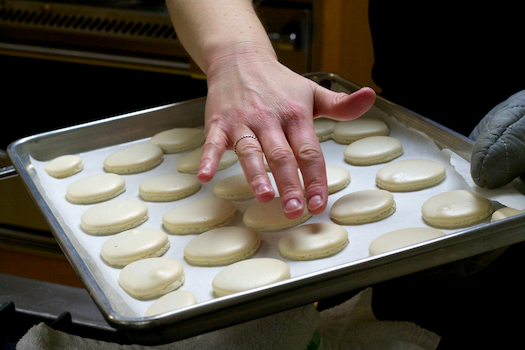 I don’t dare attempt macarons without hands-on instruction like this. Would love to learn. Yours look beautiful! 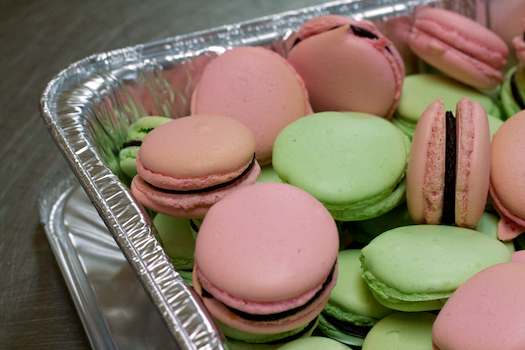 I would love to take a class to learn how to cook French macarons. I’ll have to look and see if there are any classes in Maryland.